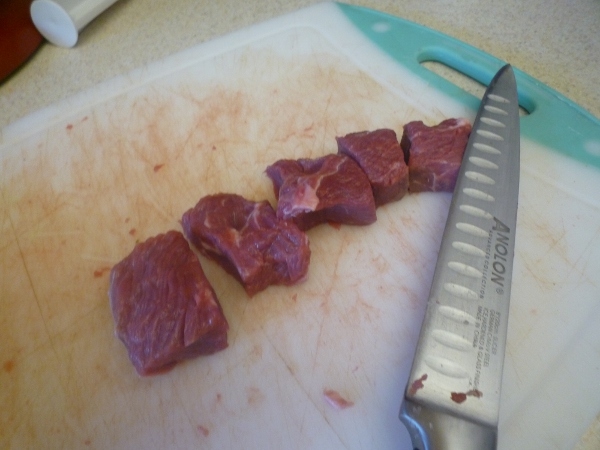 He showed me a recipe and I consulted a few other resources online to get a sense of the cuts of meat used, seasoning blends, and meat to fat ratio. Once I felt like I had a better sense of the flavors, I settled on the ingredients for a batch. 3 tbsp. 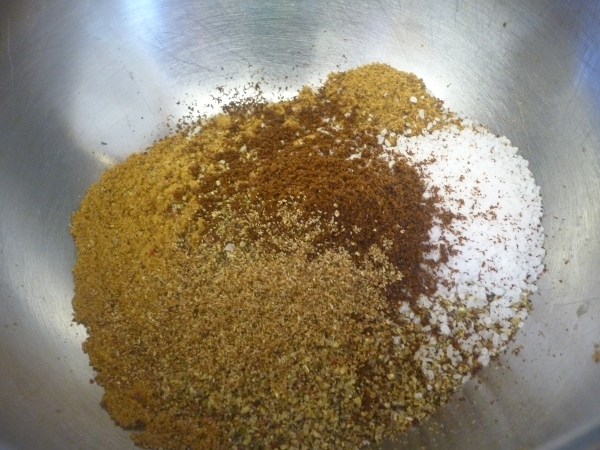 coriander seeds, toasted and then ground. 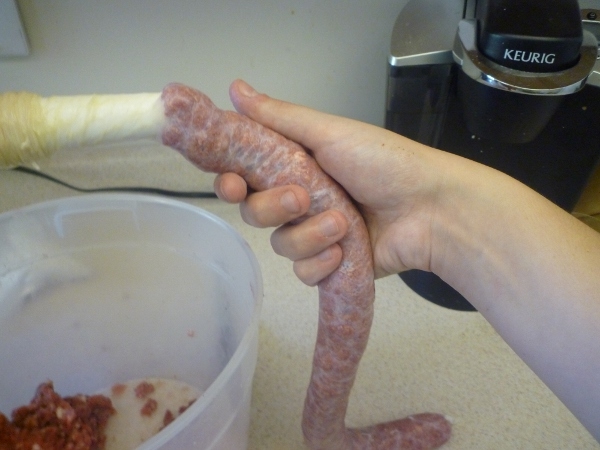 First thing’s first: Soak your sausage casings. Sheep casings frequently come in tubs packed with salt and can be preserved that way in your fridge for almost a year with no negative consequence. Soak in water that starts at 110 degrees F. while you prepare your meat and spice blends (or at least 30 minutes). The fatback will also require a pre-soak, but in a medium-sized saucepan with boiling water for about 5-7 minutes. This will remove some of the excess salt. 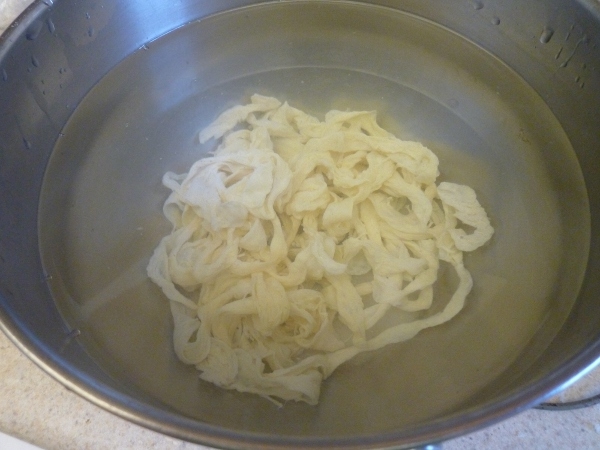 After boiling, pull the fatback out of the water and refrigerate for a little bit to firm it up. 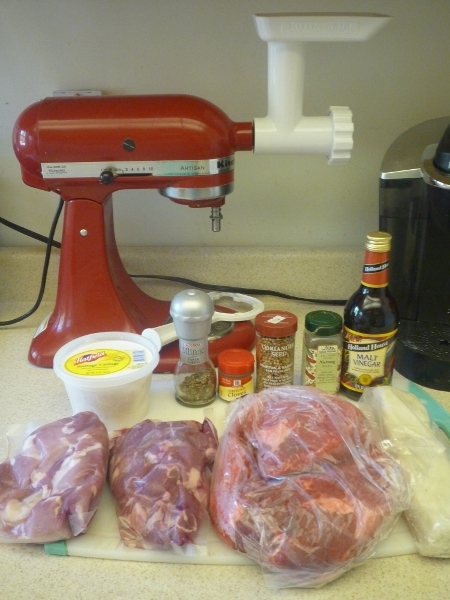 Dice the lamb, pork, beef, and fatback into small cubes. In a small bowl, combine the coriander, salt, pepper, cloves, nutmeg, and allspice. Set aside. 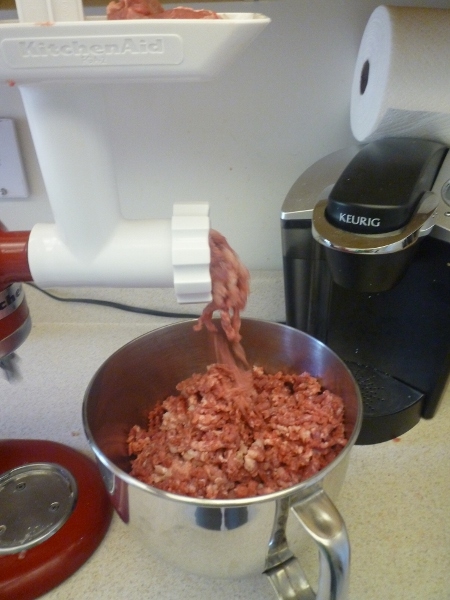 Next, grind the meat using a coarse plate. Now it’s time to add the spices and vinegar. 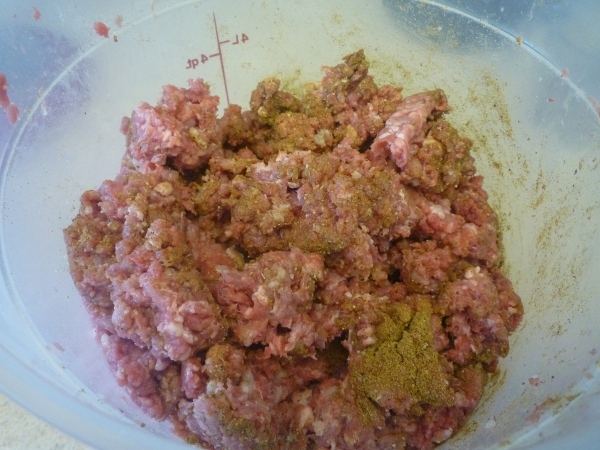 Take care not to smash the meat together too much when mixing everything together. 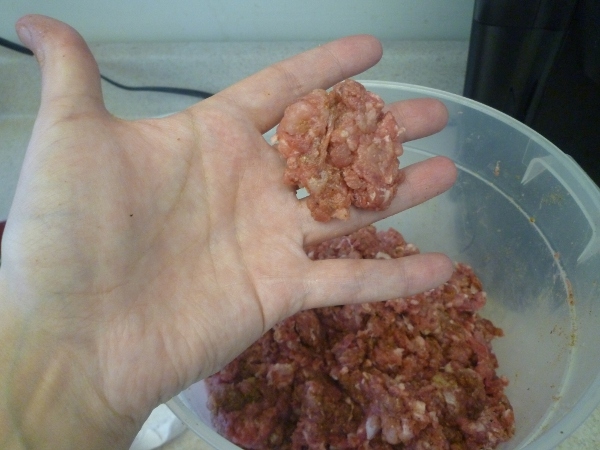 Make yourself a small patty and fry it quickly to test the seasoning. Mine needed a few extras pinches of salt and another few grinds of pepper. Otherwise, it was delicious! 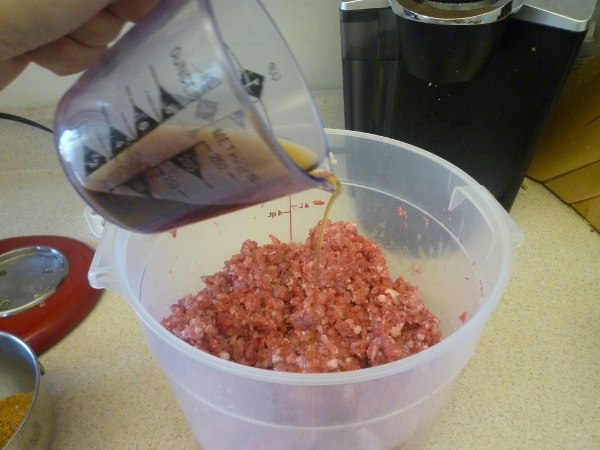 To stuff the sausage, I used the 5/8 in. tube attachment for my mixer’s grinder. Before getting the casing onto the tube, find the opening in the casing and run cool water down the length of it to remove any kinks that weren’t straightened out during the soaking process. Grease the tube with a little bit of vegetable shortening and then gently shimmy on the casing. Tie a knot at the end of the casing and you’re ready to stuff! At this point, have a pin handy so that you can prick the casing if any major air pockets form. 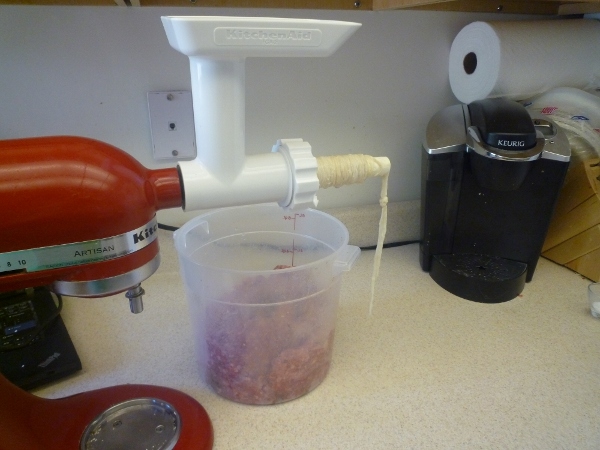 With the mixer on a low speed, feed the seasoned meat into the hopper and through the tube. The casing should slide easily as the meat is fed into it. Do not overfill or you run the risk of tearing the casing or having it burst during cooking. When you reach the end of the casing, leave 2 inches or so empty so that you can tie a knot to seal it off. 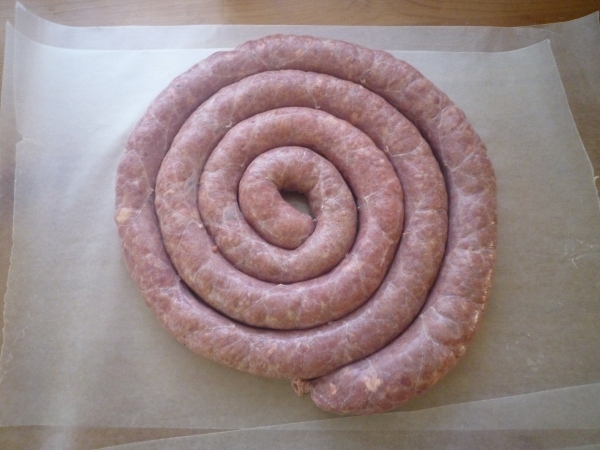 Roll the sausage into spirals and prick with a pin all over to remove excess air. 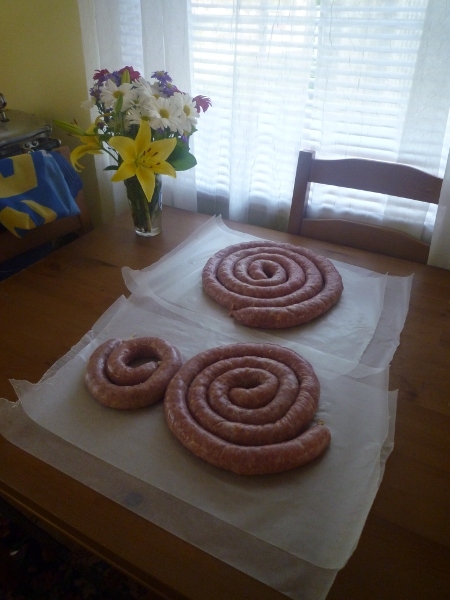 So there you have it; my first foray into making boerewors. I’m really pleased with the final product and hope that the boss-man enjoys grilling it up as much as I enjoyed making it.